You’ve made me a mean one, Mr. Grinch. The book is iconic. The holiday special is a classic. We all know this story by heart. And it makes ours grow three sizes this time of year. Illumination Entertainment, the makers of “Despicable Me”, took a major risk in making a feature-length, CGI animated version of “Dr. Seuss’ How the Grinch Stole Christmas”. The result is… a bland, uninspired holiday version of “Despicable Me”. Gru… I mean The Grinch… is tall. He doesn’t like other people. He had a troubled childhood. He’s an inventor of gadgets and gizmos aplenty. His Minion… or rather, pet is his dog Max – his sole, loyal companion. And chances are good that a little girl is going to change his outlook on life. But most of all, The Grinch is mean. Well, at least he’s supposed to be. That’s just one of the problems with this new (but not new enough) take on “The Grinch” story. This Grinch just isn’t sinister or evil enough. He’s not even as cruel as Gru, nor is he as funny or well developed. Steve Carell gives that character layers, developing a true personality. Benedict Cumberbatch (both he and Carell were nominees for the Best Actor Oscar in 2015) rarely goes deep enough to give the green guy any type of much-needed edge. 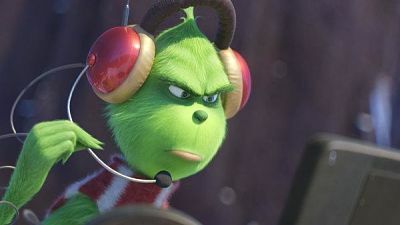 Instead, what little vibe “The Grinch” has comes via narrator Pharrell Williams (an Illumination favorite thanks to his “Despicable” music contributions). Obviously new elements had to be added to get Dr. Seuss’ legendary picture book to feature film length (which it barely does at 80 minutes plus credits). There’s a large reindeer named Fred, who’s really the only amusing element for the little ones. The most Christmas-obsessed resident in Whoville is voiced by Kenan Thompson, who provides a few chuckles. And the Mayor gets one spotlight scene. Angela Lansbury makes her first film appearance since 2011’s “Mr. Popper’s Penguins”. But the biggest beneficiary of the expanded storyline is young Cindy Lou Who. All she wants for Christmas is someone to help her over-stressed, single mom. This parallel plot is as flat as the Grinch’s scheming to spoil the Whos’ holiday. And a bit sad. Did we need a Cindy Lou Who who doesn’t have a father? Who thought that was a good idea? At its core, the messages of this version of “The Grinch” are basically same as all the rest. But that doesn’t mean the script had to be so basic and tame. There’s no deep dig into The Grinch’s past. Nothing to make us care about his eventual transformation. There just isn’t a lot here. The film is missing spirit, flavor, joy, wonder and most of all fun. Yes, the animation is pretty. Songs appropriately updated. But don’t expect families to walk-out elated. When the only time the kids laugh is when the Grinch slides into a tree, well, that certainly won’t make the grown-ups grin with glee. As for whether to spend your green, take this advice from me. On The Official LCJ Report Card, “Dr. 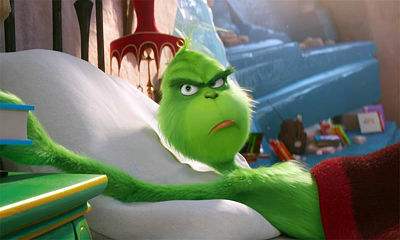 Seuss’ The Grinch” gets a very average C.